Members from anti-HS2 protest group AKA-HS2 with banners and documents they will hand to Wakefield Council leader Peter Box. Anger is mounting over the latest bombshell in a £65bn high speed rail “vanity project” which civic bosses and campaigners say will benefit the capital at the expense of our district. Wakefield Council leader Peter Box has said the economic benefits of the HS2 plan have been exaggerated following an announcement by the government’s Transport Secretary revealing his broad support to amended rail maps. 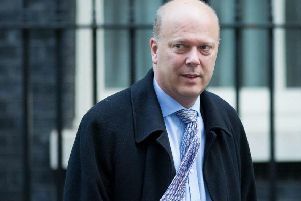 A paper published by the Conservative Chris Grayling on Tuesday agreed in principle with a plan which moves the originally proposed line 40 miles east into West Yorkshire. Council leader Peter Box said: “I do not believe that the £65bn that is to be spent on HS2 represents good value for money. Any economic benefits have been exaggerated and the proposals seem to totally ignore the many environmental concerns which have been raised. “For Wakefield there is an additional risk that our existing train service to London will be reduced. This is nothing more than a vanity project and will help London more than the North. Phase two of HS2 is set to create a line that splits north of Birmingham, with one arm heading to Yorkshire and another to the North West. The route was prospectively re-aligned from Derbyshire to West Yorkshire. This takes it near Nostell, Normanton and Altofts. Mr Dainton, president of Residents Against Toxic Schemes, said that 22 public footpaths would be cut off and years-long construction work would turn Altofts into an “island”. HS2 bosses say changes will reduce the project’s cost by around £1bn.